Today I welcome Christee Gabour Atwood! Her latest book is "A Celebration of Midlife … and Elastic Waistbands"
Was it always your goal to do a book on midlife crisis? Well, actually, it was my goal to do any book that lots and lots of people would buy and I would end up rich enough to have a maid so I could see what color my carpet is. I truly love to write and this book was actually born because I found that writing is not only a hobby, it’s my therapy. I started writing all the things that drove me crazy like the fact that Victoria’s “Secret” was that all her pictures are airbrushed. And the fact that my inner child and my outer adult have traded places and refuse to go back to their proper positions. And the realization that I have an exercise bike but it functions as a coat rack. Since this book came out, I’ve found there are a whole bunch of us who are living in midlife crisis … and actually celebrating it! And being able to share those adventures makes this period of life really funny. You offer a lot of workshops - which one do you enjoy the most? I love doing the writers’ workshops because I can really relate to the groups. Talk to me about this 101 Uses for a Rubber Chicken workshop! For example: I use a rubber chicken in meetings. Whenever someone says something negative, they get the chicken thrown to them. Then they’re stuck with it until someone else says something negative. So the chicken continues to be thrown to anyone who says anything negative. This is a great tool for reminding us to use positive language … and it’s just really funny to watch a naked chicken flapping across the room during a meeting. I also carry a rubber chicken keychain with me at all times. It reminds me not to take myself too seriously. It also never gets lost at valet parking. You write a column for City Social Magazine in New Orleans and Baton Rouge. Do you find the routine challenging sometimes? Did Katrina affect the content of your column? It’s challenging, but it’s also a way of never allowing myself to use the excuse of “writer’s block”. After all, no other profession allows you to say you’re blocked and take off work. (“I’m sorry. I can’t operate today. I have surgeon’s block.” Nope, that wouldn’t fly at all.) So, it’s good for my discipline. But there are days when nothing seems funny. Katrina was definitely one of those times. I was working at the makeshift animal shelter as evacuees came in and it affected me in a way I can’t even explain. I truly couldn’t find any humor in me. So, I turned to my quote collection. I found quotations that were inspirational or cheered me up. I introduced the column by explaining that I just wasn’t finding anything to laugh at on that day, and that these were the words that lifted me in these times. As I read through them, it actually helped me. I hope it did the same for others. Anybody who keeps a journal everyday is taking the first step to being a columnist. I highly recommend that people look at the single issue that bothers them the most in their journal pages every day and turn it around by taking a few jabs at it. You’d be amazed what it does for your mood! And it’s much less expensive than a psychiatrist. You are an "Ambassador of Mirth". Do you find optimism a tough sell sometimes? Great question! And, “Oh Yes!” is the answer. Isn’t it a shame that being happy is considered childish? So, the message seems to be that if you enjoy life, you’re not an adult. Every day people lock their joy into the pocket of their briefcases next to their PDA and leave the spring in their step in the tennis shoes that they push out of the way to get to those basic black business shoes. They save their laughter for the occasional email joke or for lunchtime. What’s great is that all it takes is one person with the nerve to laugh at herself or himself to give us permission to lighten up. I like to think I’m that person. When I walk into classes or a client’s workplace with a rubber chicken poking out of my pocket, it’s amazing to see how many people respond positively. It’s easier to be creative, to be open to unusual problem-solving, and to be less self-conscious when you’re laughing. By the way, laughter also burns calories. When I want to lose a few pounds, I read reports from the Louisiana legislature. I saw that you were also at Book Expo 2006 (and sorry we missed one another! ); what was the highlight of that event for you? I got a picture with Dave Barry!! And Dr. Ruth!! Not sure which one thrilled me the most. Dave Barry is such an incredible writer. And Dr. Ruth … well, she’s Dr. Ruth!! I visited with a number of prominent authors I really respect. I’ve even stayed in touch with a few of them. Which brings up a non-related question: What does the term “restraining order” really mean? Book Expo is one of the most exciting events you can attend. It’s just amazing to experience the energy and electricity that you get from being around writers, publishers, librarians, and so many other people who respect books like we do. You have accomplished so much! What were your first steps of success? Having career-induced A.D.D. was the first step of my success. I just couldn’t stay with one project for a long period of time, so I accumulated knowledge about a variety of useful --and many useless – things. Sooner or later all that knowledge has come in handy. I’ve been writing since I was a child and that constant emphasis on the written word was the basis of my communication skills. Then, in high school, I got into radio and that helped me focus on the spoken word. The combination of those two has made me a better communicator and that’s been the magic ingredient in everything I do. That ingredient was useful when I worked in television, newspaper, corporations, and as a Universal Studios Tour Guide. (That’s the occupation where I learned to point to my left and my right.) And it’s been priceless as I’ve started learning about the world of book promotion. The ‘communication’ that is, not the ‘pointing to the left and right’. Also, with my attention span of a gnat that’s had too much caffeine, I continue to learn new things every day. What tips can you offer for surviving a midlife crisis? Laugh. It’s going to be funny to you someday, so why not just push fast-forward and laugh at it now? Refuse to accept the fact that midlife crisis is a bad thing. If it’s an excuse to wear elastic waistbands and buy a shiny red car, it can’t be all bad! And remember, you’re not alone. There are millions of us going through the same thing. Share those experiences and we can laugh together. Try to hide them and you’ll be embarrassed alone. Any advice for authors & speakers who want to continue to grow as such? But whatever success I do have is due to my persistence and my willingness to continue to learn, practice, and beat my writing into shape with a ball peen hammer. I would make this recommendation: Find topics or stories that you’re passionate about and you will find success. Then you’re writing for yourself, so you know you always have an audience. And even if it’s not an accepted genre or keynote topic, your passion is what can make it become one. Also, write or speak even if there’s not a check involved. My other recommendation: Write every day, even if it’s just a journal entry. Opera singers clear their throats before they sing. We should clear our throats on paper so that, when we’re ready to “sing” our stories, we’re already warmed up. And the final humorous word. You know what my favorite word is? It means that no matter how badly I mess something up, I’ve still got another chance. As for my final humorous word, I would have to step aside and quote the queen, Erma Bombeck. She had the right idea when she said, “Seize the day. Remember those women on the Titanic who waved off the dessert cart.” How can you top that?? Thanks so much for letting me be a guest on your blog. I love communicating with people, laughing with them, and making them feel better about themselves by letting them see how much better off they are than I. Yes, they might be crazy, going through midlife crisis, and at the fat end of their closets, but I have all that and I quit my day job. If nothing else, that should make them feel really good about themselves. When thieves find an abandoned child lying in a monster’s footprint, they have no idea that their wilderness discovery will change the course of history.Cloaked in mystery, Auralia grows up among criminals outside the walls of House Abascar, where vicious beastmen lurk in shadow. 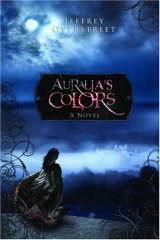 There, she discovers an unsettling–and forbidden–talent for crafting colors that enchant all who behold them, including Abascar’s hard-hearted king, an exiled wizard, and a prince who keeps dangerous secrets.Auralia’s gift opens doors from the palace to the dungeons, setting the stage for violent and miraculous change in the great houses of the Expanse.Auralia’s Colors weaves literary fantasy together with poetic prose, a suspenseful plot, adrenaline-rush action, and unpredictable characters sure to enthrall ambitious imaginations.Visit the Website especially created for the book, Auralia's Colors. On the site, you can read the first chapter and listen to jeffrey's introduction of the book, plus a lit more! I do character-building sessions at schools, walking the students through the steps of designing a believable and interesting character. They determine the background first, then the personality type and traits, then physical attributes, and fill in small details last. A book I highly recommend to the students is "Personality Plus" by Florence Littauer. It covers in depth the strengths and weaknesses of the four basic personalities - choleric, phlegmatic, sanguine and melancholy.Another book that ties in well with this is "The Birth Order Book" by Dr. Kevin Leman. The four personalities can be seen in the qualities of the oldest, middle, youngest, and only child. Once you have determined your character's personality type, it becomes much easier to have them react to situations and people in a believable fashion! "Unless you give yourself to some great cause, you haven't even begun to live." "Many times the difference between whether you achieve your goals or not is your attitude." "Be healthy so you can be more productive and successful and enjoy each day of your life more." Thanksgiving should not be the only time for which we give thanks for the blessings in our lives. Every day should be a treasured event, full of many appreciated things and people. And this weekend, with numerous wonderful emails and notes from readers and fans, I am reminded how grateful I am for them and the success they have helped me achieve thus far. I just wanted to make a difference in this world and I am thankful that I am able to through my books! Thank you Lord for the life I have now! Arkansas beat LSU last night! In three overtimes, too! Way to go little Hoggies. The Razorbacks have now eliminated LSU's chances of playing for the BCS title. And Hawaii is STILL undefeated, with the their quarterback breaking the college quarterback touchdown record. They are finally taking about Hawaii playing in the Sugar Bowl if they can just win their last game! I love BCS shakedowns like this! my wonderful husband, our kitties, a nice home, friends & family, author success, my salvation and all of the incredible things yet to happen in my life! Neta Jackson Neta Jackson's award-winning Yada books have sold more than 350,000 copies and are spawning prayer groups across the country. She and her husband, Dave, are also an award-winning husband/wife writing team, best known for the Trailblazer Books--a 40-volume series of historical fiction about great Christian heroes with 1.8 million in sales--and Hero Tales: A Family Treasury of True Stories from the Lives of Christian Heroes (vols 1-4). Dave and Neta live in Evanston, Illinois, where for twenty-seven years they were part of Reba Place Church, a Christian church community. They are now members of the Chicago Tabernacle, a multi-racial congregation that is a daughter church of the well-known Brooklyn Tabernacle. Turkey dinners, tree trimming, and decking the halls--it's that time of year again! And I Jodi Baxter, can't wait to celebrate. My kids are coming home for Thanksgiving and Christmas, and then all of us Yadas are getting decked out for a big New Year's party.But God's idea of "decked out" might just change the nature of our party plans. A perplexing encounter with a former student, a crime that literally knocks me off my feet, a hurry-up wedding, and a child who will forever change our family...it's times like these that I really need my prayer sisters.This holiday season, we Yada Yadas are learning that no one can out celebrate God. 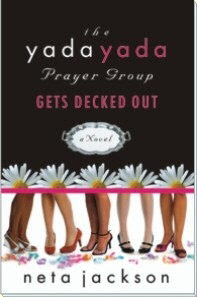 So let's get this party started!THE YADA YADA PRAYER GROUP GETS DECKED OUT is a festive novella featuring America's favorite prayer group, the Yada Yadas!Sometimes dubbed "chick-lit" for their bright covers and catchy titles, this series provides far more depth than witty banter and wacky situations. Inspired by a prayer group of real women, each book will have you laughing, crying, and perhaps praying anew.In this highly anticipated installment, the Yada Yada sisters-a group of multi-cultural friends-and their families prepare for the event of the season.But yes, eager readers, this novella—which picks up a year and a half after the end of book #6 The Yada Yada Prayer Group Gets Rolling concludes the series with some twists and turns that will amaze and encourage you. Plus, it sets the stage for Neta’s new series with new characters and new situations but also occasional roles for the beloved Yada Yada sisters in familiar Chicago neighborhoods with all their cultural richness. "The amount of big T that drips on the brain during fetal development will determine how strongly a child demonstrates certain characteristics typically considered male or female. Now that explains a lot! Do something every single day to promote your book!!! This is a special thank you to the crew at the Waldenbooks in Martinsville, VA! They are so supportive and such big fans of my series. That makes all the difference in the world!! They've read my books and understand how to promote them. I will always visit the awesome Waldenbooks in Martinsville! Thanks Lynne, Tammi, Joy, Greg, and Jesse!!!! With only a few dates left on my tour, and a couple seminars and a school, I have finally been able to return to my writing. I have missed it tremendously. Now I am full steam ahead with completing HEATHER and bringing The Circle of Friends to a close. James Scott Bell is a former trial lawyer who now writes full time. He is also the fiction columnist for Writers Digest magazine and adjunct professor of writing at Pepperdine University.His book on writing, Plot and Structure is one of the most popular writing books available today. The national bestselling author of several novels of suspense, he grew up and still lives in Los Angeles, where he is at work on his next Buchanan thriller. On a wet Tuesday morning in December, Ernesto Bonilla, twenty-eight, shot his twenty-three-year-old wife, Alejandra, in the backyard of their West 45th Street home in South Los Angeles. As Alejandra lay bleeding to death, Ernesto drove their Ford Explorer to the westbound Century Freeway connector where it crossed over the Harbor Freeway and pulled to a stop on the shoulder.Bonilla stepped around the back of the SUV, ignoring the rain and the afternoon drivers on their way to LAX and the west side, placed the barrel of his .38 caliber pistol into his mouth, and fired.His body fell over the shoulder and plunged one hundred feet, hitting the roof of a Toyota Camry heading northbound on the harbor Freeway. The impact crushed the roof of the Camry. The driver, Jacqueline Dwyer, twenty-seven, an elementary schoolteacher from Reseda, died at the scene.This would have been simply another dark and strange coincidence, the sort of thing that shows up for a two-minute report on the local news--with live remote from the scene--and maybe gets a follow-up the next day. Eventually the story would go away, fading from the city's collective memory.But this story did not go away. Not for me. 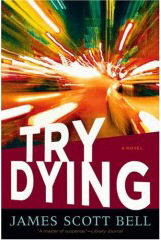 Because Jacqueline Dwyer was the woman I was going to marry.In Try Dying, this fast-paced thriller, lawyer Ty Buchanan must enter a world of evil to uncover the cause of his fiancee's death--even if hie has to kill for the truth. Clinton as President is Nuts! I don't normally get political here, but there was an article on CNN that made me chuckle. Joel Surnow, creator and executive producer for the TV show "24" claims that Clinton as president is nuts! 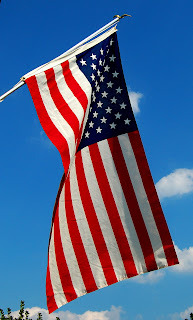 Yesterday was actually Veteran's Day, but the sentiment is what matters! A salute to all the men & women who have served our country for the past few hundred years, defending our freedoms and way of life. "I won't voice my opinion of the BCS ranking & bowl system. "But I will point out a team who defies that system - Hawaii. "They are now undefeated, only one of two teams remaining who can make that claim. The quarterback just tied the NCAA record for career touchdowns - 121. With three games remaining in their schedule, he will likely own the record, and if they win all three games, have a shot at one of the BCS bowl games. "I always root for the underdog, for the team with the most heart and spirit, the ones who dream biggest. And right now, that would be Hawaii. "And just maybe they might also change the design of the BCS!" Today marks the birthday of The Writer's Meow! I and two others founded and run this writer's club on Deviant Art. What began with a handful of people now boasts over two hundred members! We've become one of the largest writing clubs on DA, with contests, writing tips, author quotes, news and amazing club members who post their work and critique others. If you're a writer and not part of any club, you need to join one! It can be so rewarding!!! Success can be called many things - what would you call it? Robert is an award-winning author of over a thousand published articles and short stories. He is currently a contributing editor for New Man magazine. His work has appeared in Reader's Digest, Travel & Leisure, Modern Bride, Consumers Digest, Chief Executive, and The Arizona Daily Star, among other publications. In addition, he previously worked as a celebrity journalist, interviewing Stephen King, Tom Clancy, Charlton Heston, and others for magazines such as Rocky Road, Preview, and L.A. Weekly.Robert is an avid scuba diver, swimmer, reader, traveler, and a law enforcement and military enthusiast. He lives in Colorado with his wife and four children.Robert's first novel painted a scenario so frighteningly real that six Hollywood producers were bidding on movie rights before the novel was completed. His acclaimed debut novel, Comes A Horseman, is being made into a major motion picture by producer Mace Neufeld and his short story "Kill Zone" was featured in the anthology Thriller, edited by James Patterson.Bob has sold the film rights to his second book, GERM. And he is writing the screenplay for a yet-to-be-written political thriller, which sold to Phoenix Pictures, for Andrew Davis (The Fugitive, The Guardian) to direct!He is currently working on his fourth novel. Deep in the isolated Northwest Territories, four friends are on the trip of a lifetime. Dropped by helicopter into the Canadian wilderness, Hutch, Terry, Phil, and David are looking to escape the events of a tumultuous year for two weeks of hunting, fishing, and camping.Armes with only a bow and arrow and the basics for survival, they've chosen a place far from civilization, a retreat from their turbulent lives. But they quickly discover that another group has targeted the remote region and the secluded hamlet of Fiddler Falls for a more menacing purpose: to field test the ultimate weapon.With more than a week before the helicopter rendezvous and no satellite phone, Hutch, a skilled bow-hunter and outdoor-survivalist must help his friend elude their seemingly inescapable foes, as well as decide whether to run for their lives...or risk everything to help the townspeople who are being held hostage and terrorized.An intense novel of character forged in the midst of struggle, survival, and sacrifice. 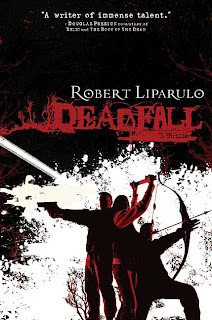 Deadfall is highly-aclaimed author Robert Liparulo's latest rivetingly smart thriller. This weekend my tour took me through Ohio and I got to meet a dear friend and fan for the very first time! 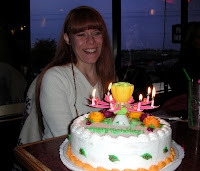 Linda and her daughter took me out to eat afterwards and the staff brought out a cake with "Congratulations Spunky!" across the top! This is the reason I keep writing and touring. Special friends are worth any cost! My last big road trip is this weekend, although I still have many signings, seminars and a school visit planned through December 8th. This trip is special, as I have several fans who are close to my heart that will be coming out to see me. No one told me of all the friends I would make as an author, but I am loving it! My spring calendar of seminars is filling up rapidly as well! Happy November - Christmas will be here before you know it!